The 2016 Rally America schedule is out and the 2016 Subaru WRX STI will have less challenges. What changes did officials make? Last year David Higgins who drives the Subaru WRX STI for SRT USA called it a driver's worst nightmare. He was referring to the second race on the Rally America schedule, at Rally at the 100 Acre Wood. This year officials have changed the date for the Missouri event and moved the rally race back almost a full month to March 18-19. Why did they do it? The Rally at the 100 Acre Wood in Salem, Missouri is usually held the last weekend in February and generally offers mild, fast and dusty conditions for the drivers. Snow and single digit temperatures transformed last year’s second rally race into a white knuckle snow event. Officials said that’s why they made the date change to later in March. Even with all the snow and ice last year, Higgins dominated the race from the beginning and was able to navigate the course that turned into a true snow event. Ice covered 50 percent of the roads and some turns would switch from gravel to ice making it extremely challenging for all the drivers. Will Ken Block enter the rally race? Ken Block who loves the ultra fast gravel course at the Missouri rally didn’t enter the event and we will see if the new dates will draw him back to Rally at the 100 Acre Wood this year. He hasn’t announced his 2016 race schedule as of this writing. The new Rally America 2016 schedule is out and will again comprise eight events spanning the continental U.S. Check out the full 2016 Rally America Schedule below. 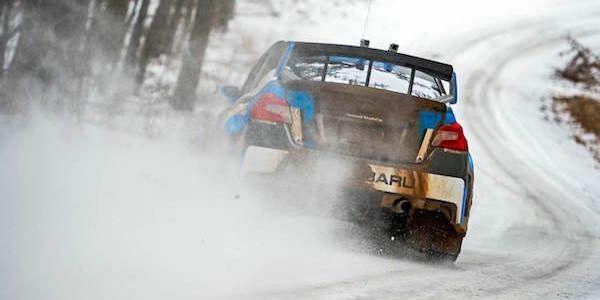 Rally America’s first event for 2016, Sno*Drift Rally is just four weeks away. Can David Higgins and Craig Drew repeat as Champions in the 2016 Subaru WRX STI? What changes has SRT USA made to the new STI? Stay tuned.